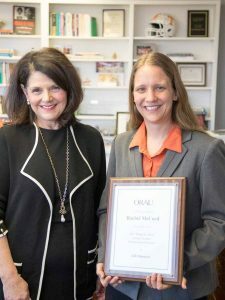 Rachel McCord (right) pictured with the Chancellor of UT-Knoxville, Beverly Davenport. Rachel McCord was awarded a Ralph E. Powe Junior Faculty Enhancement Award from ORAU (Oak Ridge Associated Universities). Winners are chosen from applicants from over 100 universities associated with Oak Ridge. 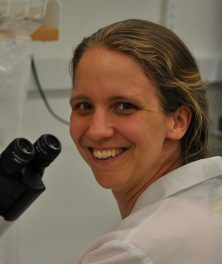 This award will help fund her research on cancer cell migration.